L-R: Adam Sinclair, Peter Broughan, Pat Campbell, Rachel Low, Michael Trevett. Adam, Rachel and Michael are Fourth Year Film and Media students in the Division of Communications, Media and Culture. Some of the biggest movers and shakers of Scotland’s film and TV production scene have been stepping out from behind the camera at the University of Stirling, as part of a national project to document their lives and careers. Pat Campbell, production designer on hit BBC drama Wolf Hall, gave a privileged insight on Wednesday into her long career, in the latest in a series of interviews recorded with film producer and project director/founder Peter Broughan, of Rob Roy Films. She joins an illustrious group, which includes director Bill Forsyth of Local Hero and Gregory’s Girl fame, writer and artist John Byrne, and comedian, writer and actor Sanjeev Kohli, all interviewed recently. Filmed by University staff and students, the footage will form part of the Scottish Cultural Memory Project - a collaboration between the University’s Communications, Media and Culture Division, and Peter Broughan. The Creative Scotland-funded SCMP initiative has aimed to capture and preserve the memory of cultural production in Scotland, through interviews over two phases with prominent practitioners from film and TV. These will be saved in an online archive at the University - already containing other rare archive materials - and be accessible to researchers, academics and the general public. Its director hopes that SCMP will become a permanent feature on the landscape and cover all forms of cultural production in Scotland. In 2014 a large number of ‘Aye Write!’ book festival sessions in Glasgow were filmed, including talks by Alasdair Gray and William McIlvanney. Dario Sinforiani, Head of Production Teaching in the Division of Communications, Media and Culture, said: “This has been an unparalleled opportunity for students to be involved in productions which document the work of some of Scotland's most important cultural figures. “Writers, producers and directors have given a candid insight into their work, their lives, and the cultural landscape of Scotland over the past half century - and Stirling students and staff have recorded this for posterity. Peter Broughan said: "It has been both a joy and a privilege directing the SCMP at its University of Stirling base. I have been struck by the tremendous generosity, honesty and openness of the very eminent subjects we have interviewed here. Peter added: “The project is also deeply indebted to the students who have crewed the interviews with such concentration and professionalism, and the staff who have helped to shape the talents of such excellent people, and laid the ground for the sessions. “In this one project is contained therefore both the vibrant past of the Scottish production industries, and the emerging talents who offer such hope for the future." Pat Campbell, production designer and SCMP interviewee, said: “I think it’s a lovely idea to capture the memories. Film and TV is a particularly difficult industry to get into. Anything that can give young people points of communication or reference – to find out the jobs that are available in it, and the skills that you need – is hugely helpful. The Scottish Cultural Memory Project has been a two-year funded project. Over 25 interviews have been recorded, with University staff and students involved throughout. Peter Broughan’s credits as a film producer include Rob Roy and The Flying Scotsman. He worked on two celebrated TV series written by John Byrne, as script editor on Tutti Frutti and as producer of Your Cheatin’ Heart. For more information, please visit: http://libguides.stir.ac.uk/projects/SCMP. Scotland's most celebrated film director, Bill Forsyth, said: "It was quite a unique feeling being interviewed for the SCMP. I felt like some kind of time traveller. I was very conscious of the fact that the stories I was recounting could lie dormant in the archive for aeons, to be retrieved perhaps by some academic in the distant future, researching a dissertation on the “Ancient Beginnings of the Scottish Audio Visual Cultural Sector”. 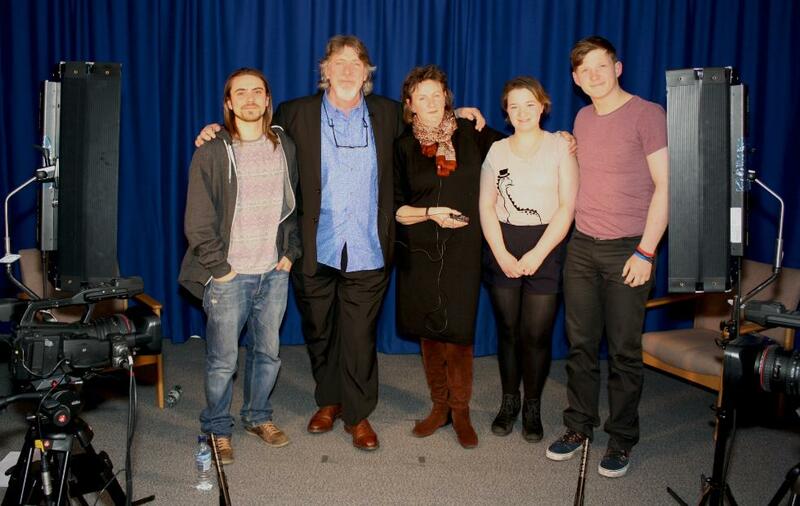 “And the whole thing was being recorded by the present day Film and Media students at Stirling University. I didn’t know I had so many stories in me. The occasion itself brought them out, and made their telling a meaningful experience for me at least, if not for those future retrievers." Sanjeev Kohli, whose acting credits include the popular Still Game, said: "I was never going to say no to being in the same club as John Byrne and Bill Forsyth - if their experience was anything like mine I very much look forward to their contribution. Tom Holden, a 4th year film and media student, and a camera operator on SCMP, said: “I have had the chance to meet people who have had major influences on Scottish cinema, television and media.